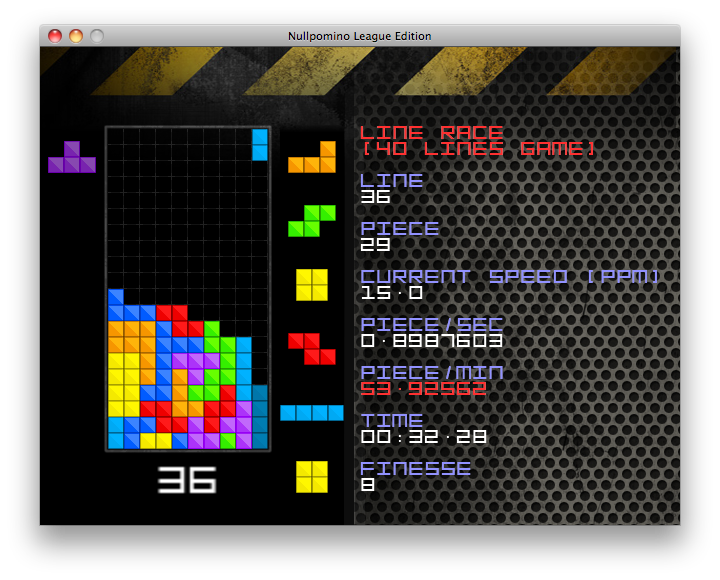 Compete in the league, track progress and compare yourself with the best players in the world. Time to get real, sign up now to start earning your badges, socialize and enter the season so you can compete in the tournaments of your playing level. Start in the Bronze ladder and work up your elo ranking to get up to Silver and Gold. If you are really pro you can compete to get the title of Grand Master. The new environment will give every player a total new gaming experience. No more hide-and-seek with windows, just play! No hassle with configuration options to get what you want. 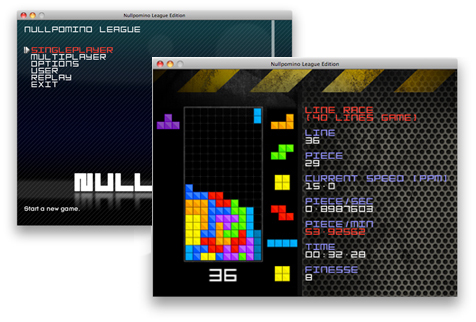 The league mod is based on simple configuration and standardisation. Keep track of your pogression over time. Want to sprint faster? With perfect finesse? See how you get better over time. Watch the fluctuations of your ELO rankings and much more. Play 40L, 20L and 10L sprints and compare to your friends. 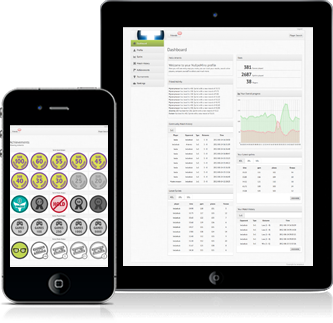 Track your progression and get in depth sprint reports with exported fumens, graphs and statistical material to analyse your sprints like never before. 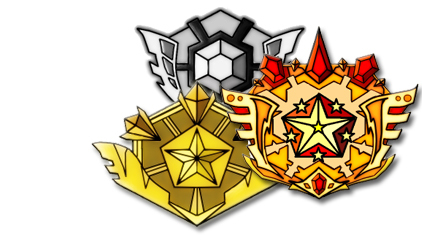 The game has a lot of badges you can earn. The badges are shown in the badge showcase on your profile. 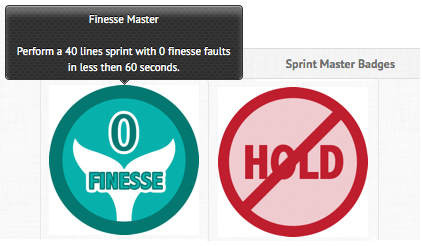 Earn respect from other players by getting the hard to get badges like accomplishing a sprint with 0 finesse or become a bully. You start in the Bronze division with an ELO ranking of 1500. Matches are first to 5 wins. Play 5 matches to get into the rankings, then climb up the ladders to 1650 to get to Silver and then proceed to Gold. The best players of the season earn the title of Grand Master. Feel free to log in and watch games of the Grand Masters live! The organized tournaments are based on your division/ranking. Follow friends to keep track of their records. 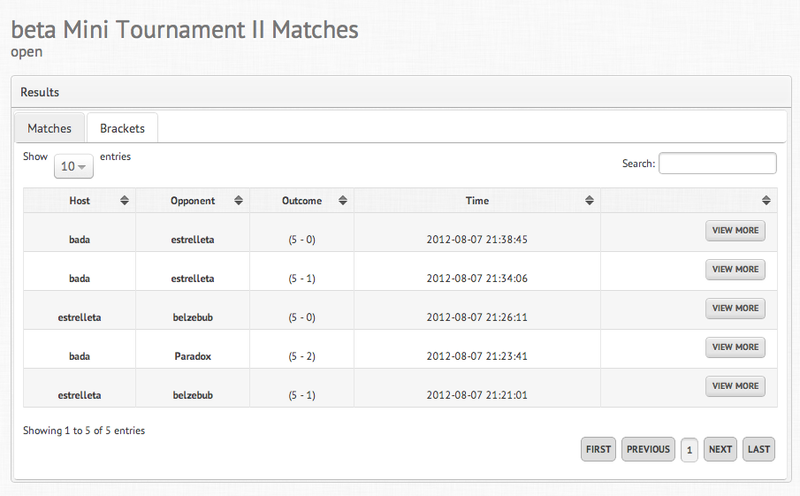 View the results of tournament matches. Get the game history of two players that will compete in a tournament final. Search for players. Edit your profile and much more. Believe the hype. Create your account now. BETA Compete in the Beta Season now! Search here first before asking a question to the crew! Will this replace my old NullpoMino? Will my old records be transferred? No. But from now on, all your stats will be on the website. So whenever you download a new client, your records will be saved. Can I delete my old Nullpo? Yes, but you should keep a backup of your replay files in the rep folder as well as your reports in the report folder if you want to keep them. How do I search players? Use the search box on the top right. It's ajax. Wait for the results to show up. How can I see all the matches of player A vs player B? Go to player A's match history via his profile. Use the filter on the top right to filter out matches against player B. Go to your profile. In the menu on top appears a new menu item: edit profile. Wow the game is faster then me, how do I adjust? Go to Options -> tuning. Adjust DAS and Repeat delay so the game is comfortable to you. Leave diagonal move on auto. Where can I find my sprint report? 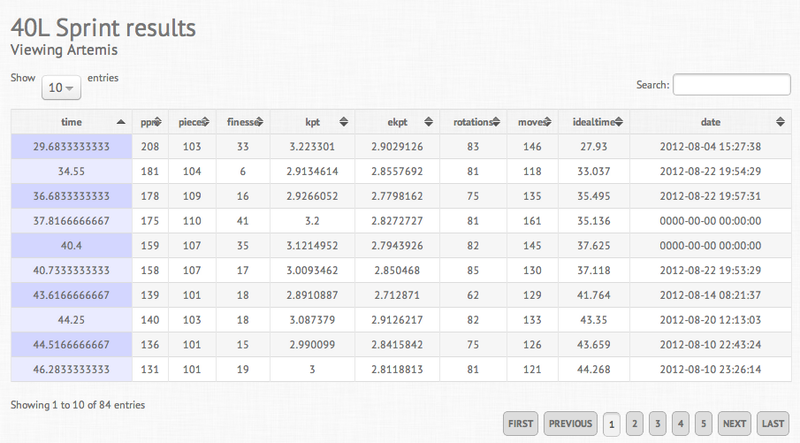 Watch in the report directory for an in depth sprint report. 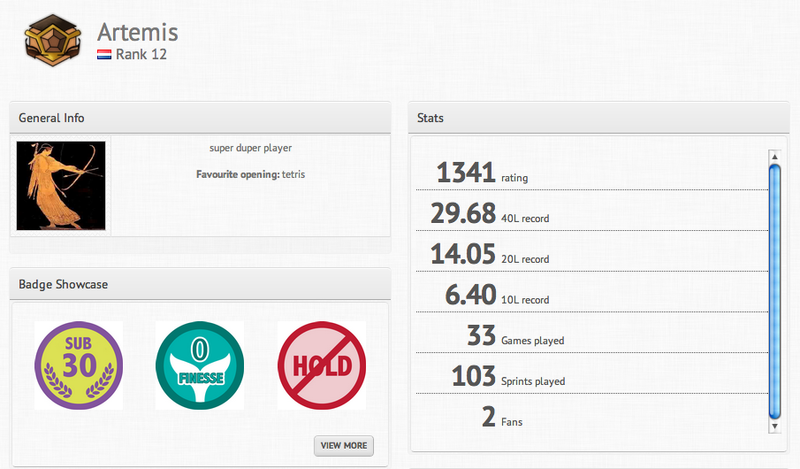 General sprint stats are on the website. My reports don't contain fumens, where can I change this? Go to Options -> general. Turn on Fumen Recording. If you want replays of your sprints and yes, even games, enable full frame fumen recording. Be aware that this takes resources. If you experience delays, disable fumen recording for multiplayer. For sprint it only has an impact after the sprint and shouldn't be a big impact, depending on your system. The fumens are sent to the site and will probably be available in a later stadium. A lot of things are changing and distracting me from my sprint, can I disable that? Go to Options -> general. Choose the basic view. If you want to see advanced stuff like finesse, choose the advanced view. What is a match? I was playing and everything disappeared? Matches are played first to 5. If you have 5 wins you win the game. If your opponent has 5 wins you lose. I can't play a tournament match? You can only play tournament matches if a tournament is going on. How much garbage is sent? Why is my four wide not killing everybody? Probably a problem with your graphics driver. Find the log_slick.txt file in the log directory and look at the end of the file. If there is an error about graphics, e.g. about pixel shading your graphic card is not supported. Try to update the drivers of your graphic card (e.g. the latest NVidia drivers). My game screen stays black when I start. Try to click in it to activate the game canvas. When I startup I receive an error: "Version not supported." Try to update your Java version to at least java 6. Check your java version in the command line (command prompt) by typing "java -version". I get "org.lwjgl.LWJGLException: Pixel format not accelerated"
Try to update the drivers of your graphic card (e.g. the latest NVidia drivers). 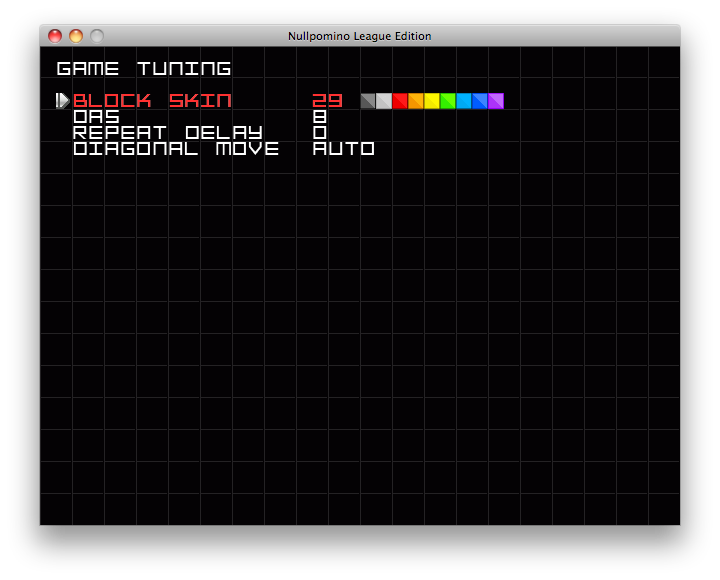 If that doesn't help try to update to the latest opengl version (e.g. install the latest divx). If it still doesn't work I'm sorry for that.